Has the incandescent lamp finally burnt out? Artists have exploited light as an essential part of art since the days of the old masters. Techniques like chiaroscuro use light to model the subject, to give depth to the two-dimensional rendition. These artists had two forms of light at their disposal, hard light from the sun, and soft light from a cloudy sky. The light could then be modified with diffusers and reflectors. When photography into use in the mid 19th century they adopted the lighting techniques of the painters. Many artists constructed studios with north facing windows to flood the room with diffuse light. Alongside photography another technology was developing, artificial lighting. More recently governments have been encouraging research and development into the transition to LEDs for business, domestic and street lighting in order to save the power consumed by lighting. The media and entertainment sector can also leverage the results of this research. Apart from power-saving, more efficient light means less demands for air conditioning and cooler talent. Sweating under the studio lights could be consigned to the history books. Part 1 of a three part series in which I look at the theory and technology of lighting, and how the LED is taking over. DPs use lighting for many qualities beyond simply illuminating the scene. One function is to lower contrast so that the dynamic range of the scene can be captured by the camera. Lighting sets the mood; it gives texture and depth. Over the years luminaires have been developed to give great control over scene illumination, from hard spotlights through to large area lights. Not unnaturally DPs expect the same range of control from luminaires powered by LEDs. Cinematography might have started out using our primary light source, the sun, but artificial light rapidly became essential for filming interiors and to supplement daylight. The original electric light sources were carbon arcs followed by incandescent. Electric lighting also allowed more control over light. Daylight can be modified with reflectors and scrims, but the sun is where it is. Electric lighting allows complete control over the direction, softness/hardness, and colour. The fruits of the research into LEDs has transformed the device from the simple monochromatic indicator, typified by the red LED power indicator, into the white fittings now used around the home for general lighting service. LEDs can now be found in street lights, high-bay lights, and stadium lighting. The requirements for these applications, as domestic lighting are different from film and video. Professionals look for colour accuracy, and the ability to shape the light. In the domestic environment more subjective characteristics count: sterile/clean or soft/warm. The adoption of LEDs for film and television was initially restricted by issues like colour rendering and lack of power. The first video luminaries were the rectangular and square panels comprising a grid of discrete LEDS. More recently manufacturers are supplying more advanced designs like fresnel spots, better suited to painting the scene with light. The high efficiency and low power demands of LED lights now offer many advantages for field production like ENG, as well as general studio lighting. As the technology has improved in leaps and bounds over the last few years, they are now accepted as a viable alternative to tungsten, HMI and fluorescent. The measurement of light as perceived by the human eye is called photometry, (as opposed to radiometry which measure absolute power). Photometric measurements are weighted with a luminosity function, which is based on the spectral sensitivity of the eye. The basic measurement of photometry is luminous intensity. It is an SI base unit, the candela, which approximates to the intensity of a single candle. The object reflects light according to its colour and texture, the power emitted, luminous exitance, is measured again in lux. 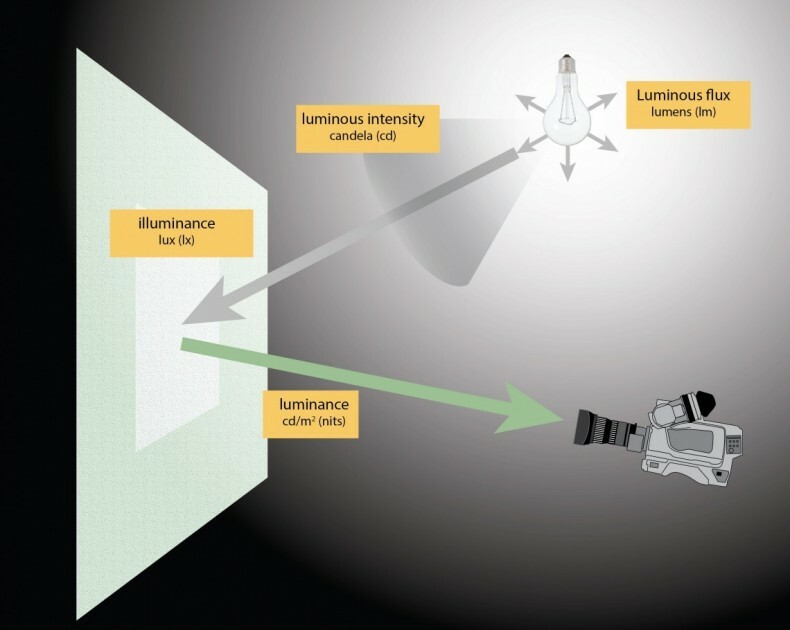 The luminous intensity per unit projected area of any surface, as measured from a specific direction is called luminance and measured in candela/m2, often referred to in the industry as nits. An incident light meter measures illuminance, whereas a reflected meter reads luminance. luminance candela per square metre cd/m 2 (nits) Luminous weighted power per unit solid angle per unit projected source area. Light is not just about power, but also the spectral characteristics. These are what gives it the emotional responses like warm and cold. Spectral power distribution (SPD) describes the power per unit area per unit wavelength of an illumination. The SPD of a light source tells us much about the quality of light, specifically it gives an indication of the general balance of blue versus red, which influences the correlated colour temperature, and the colour rendering. A smooth distribution will likely render colours more accurately than a source with peaks at certain wavelengths and/or troughs at others. The sun is close to a black body, but the surface layers of the sun and out atmosphere absorb some wavelengths. The spectrum of sunlight obviously varies with inclination in the sky. Tungsten, incandescent lights also have SPDs close to a black body radiator, but lower temperature than sunlight. The SPD shows how most of the energy is in the infrared, hence wasted in lighting applications. Fluorescent lights have a spiky, even discontinuous spectrum. CCT is not a measure of lighting quality, especially for sources with a non-continuous spectrum like fluorescents and LEDs. An object lit by two luminaires with the same CCT but different SPD may appear to be a different colour under the two different lights. To give an idea of the colour rendering, a different measures are used. The CRI measures the chromaticity of 8 standard test colours under the light source to be measured references that chromaticity against reference illumination. The exact procedure is detailed in a CIE technical report (CIE 13.3-1995). A CRI of 100 indicates a complete match to the reference light. For film and television lighting a CRI value over 95 will typically be required. This is higher than most general purpose fluorescent and LED lighting. In general the lower the CRI, the more efficient the light source so applications like street lighting are efficient, but have poor colour rendition. TV and film lighting will sacrifice efficiency to achieve good colour rendering. The full-spectrum index measures the difference between the spectral energy distribution of a lamp deviates from a full spectrum. The index is transformed to a scale of 0 to 100, the FSCI, comparable to CRI. 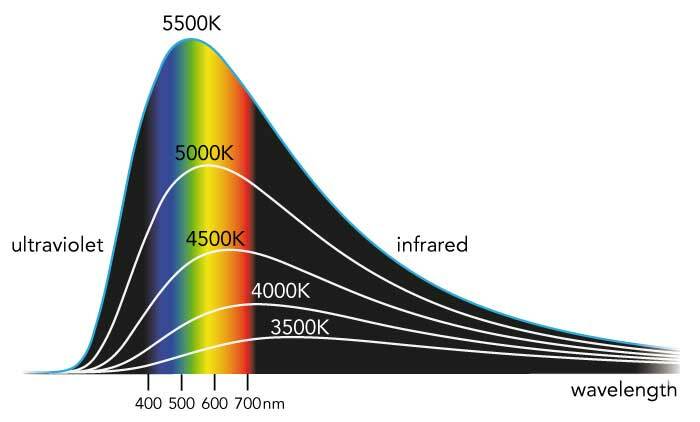 A light source with a discontinuous spectrum like a fluorescent could have a typical value of 50. A monochromatic light source like low pressure sodium will rate zero. 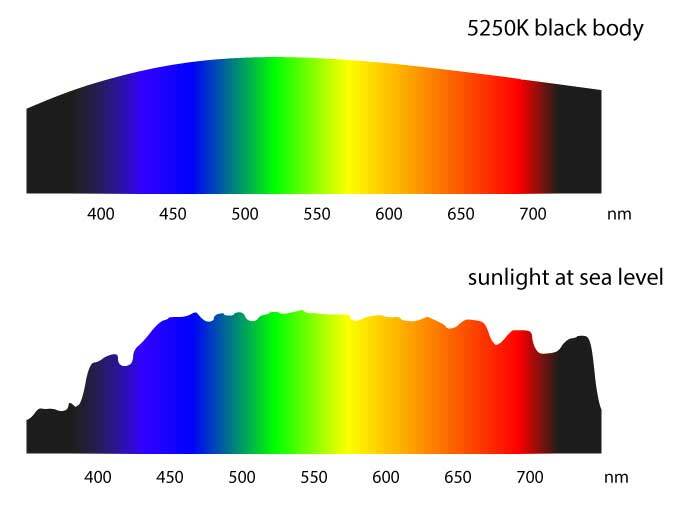 Phosphors in a lamp can be selected to achieve a good CRI with the test colours, but FSCI is a better indication of how well small colour differences in the scene can be discriminated. Gamut area measures the illumination in terms of the colour space it occupies. A light source with a small gamut will not discriminate highly saturated from less saturated colours. The CRI has deficiencies, especially for measuring LED sources. First the test colours are unsaturated pastels. The test method does not work well with narrowband emitters like LEDs, and can give misleading results. The U.S. National Institute of Standards and Technology (NIST) is developing a new scale, the colour quality scale (CQS). An alternative method of measurement is the Television Lighting Consistency Index (TLCI), published by the EBU. The TLCI mimics a complete television camera and display, using only those specific features of cameras and displays which affect colour performance.The Index uses a ‘Standard Television Camera Colour Model’ based on a 3-chip camera. Although successful at predicting the colour rendition of conventional cameras, it is reported that it is not so good with CFA Bayer sensors (Art Adams). Colour measurements can be measured with a spectrometer. The conventional colour temperature meter, which uses a trio of RGB sensors, will not give accurate results with discontinuous spectrum light sources. In most product specifications, CRI is still the favoured parameter and the only internationally accepted measure. The solution to the uncertainty of the colour rendering is real world testing, as CCT and CRI cannot tell the whole story. Just as DPs test lenses, film emulsions and digital cameras before a production, lighting can be tested with the cameras to be used in a production to see how the sensors render colours. DPs will look for many qualities: how natural do colours appear (see metamerism below), can subtle shades of colour be seen (FSCI), and how are saturated colours rendered (gamut)? It is easy to imagine colour as a physical phenomenon, but it is a quality that we create in our brains, in the visual cortex. In our tri-stimulus vision, and with cameras, a scene is filtered into short, medium and long wavelength bands. The consequence of this deconstruction is that two objects that have reflect light with different SPDs can appear to be the same colour. These are call metamers. If these metameric objects are illuminated with light sources with different CCT, then they may look the same colour at one CCT, but different colours at a second CCT. This is termed metameric failure. To avoid the problems of metameric failure it is important that the luminaires have a relatively smooth SPD. This was an issue with early fluorescents with their peaky spectral emission curves, and remains an issue with low cost LED lights, which are often deficient in the cyan region. This not an issue that should be “fixed in post”. In part 2, I will look at ways to generate light, and talk about developments in LED luminaires.